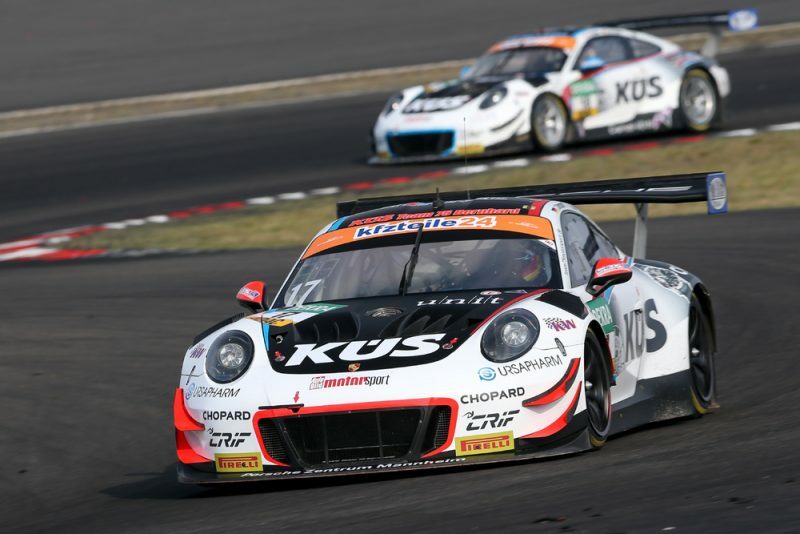 Porsche works drivers Timo Bernhard and Kévin Estre put in a gripping charge through the field on Saturday at the Nürburgring: With a spirited drive for KÜS Team75 Bernhard, they made up seven places at round seven of the ADAC GT Masters Rang to ultimately finish on sixth. Porsche Young Professional Mathieu Jaminet and Robert Renauer crossed the finish line after a turbulent race on 16th. At the halfway mark of the season, the Precote Herberth Motorsport drivers rank third in the drivers’ classification. A total of three safety car phases and 13 retirements guaranteed some thrilling race action at the foot of the Nürburg castle. Start driver Bernhard from Germany qualified his 911 GT3 R on the 13th grid spot on the 3.629-kilometre sprint track. In the race, the two-time world sports car champion and the 2018 Le Mans winner Kévin Estre (France) steadily made their way up the ranks. A five-second pit stop penalty, however, prevented them from achieving a better result. “At the start I had to veer to the left to avoid an accident and because I wasn’t directly behind the competitor in front of me we were handed a penalty. Apart from that, the race went well for us. In the first lap I managed to make up six positions. After handing the car to Kévin, he continued to push through the field. It’s not quite enough for a podium spot at the moment, but we’re on the right track,” said Bernhard. Taking off from 14th on the grid, Jaminet (France) and Renauer (Germany) finished on 16th place in the second-best 911 GT3 R run by Precote Herberth Motorsport. As the race progressed and the tyres gradually deteriorated, the German-French duo could not maintain the initial pace. After the seventh of 14 rounds, the pair ranks third in the drivers’ classification. “We changed a lot on the setup, but we didn’t find the optimal compound. Now we have to work through the night to analyse the reasons for this. It’s good that we’re within striking distance in the drivers’ classification,” explained Renauer. IronForce by Ring Police crossed the finish line on position 19. Start driver Jan-Erik Slooten and Lucas Luhr from Germany made up 16 places at the home race of the newcomer squad from the Rhineland. “During the first half of the race we had contact with another vehicle which sent me into a spin. After an early pit stop, Lucas went on to make up several places. The 911 GT3 R ran perfectly. Our pace was good and so were the lap times,” said Slooten.